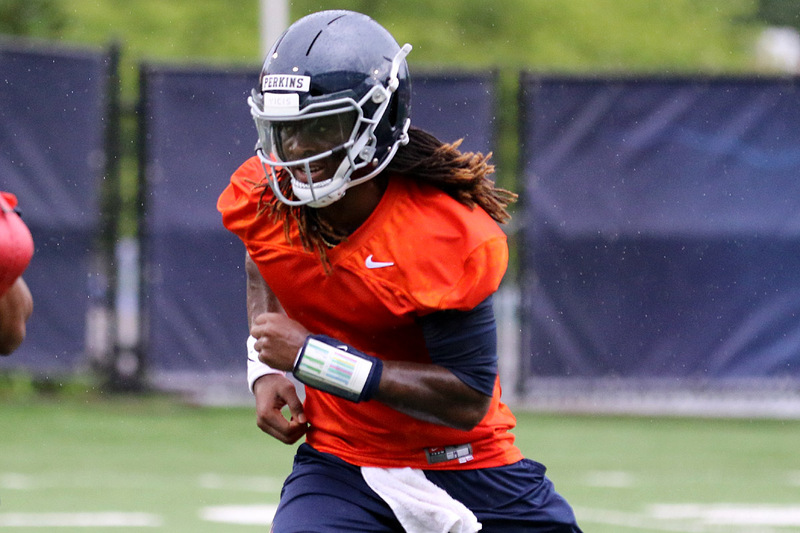 New quarterback Bryce Perkins is the dual-threat quarterback Bronco Mendenhall has coveted. He has the physical tools and maturity, but he still has to translate that onto the field. We have seen only glimpses of the 2018 Virginia Cavalier football team this preseason. However, based on last year’s performance and returning experience I have ranked each position from strongest to weakest prior to the season opener versus Richmond. This “99 Virginia Football Thoughts” entry focuses on offense, which has some intrigue with a new quarterback and more speed at receiver but lacks proven depth at almost every position. Because of the sheer production returning, wide receiver gets the preseason nod for strongest offensive position. That doesn’t mean there aren’t questions, which we’ll tackle in a bit. The Cavaliers return leading receiver Olamide Zaccheaus, productive and reliable tight end Evan Butts, and wide receiver Joe Reed, who needs to become a more consistent producer in the offense but certainly has shown the ability to make plays. Junior Hasise Dubois brings size and experience, while sophomore Terrell Jana received a taste of major college competition last season. There are questions, though. Proven depth is a major one. Another is replacing the big-play capability of Andre Levrone, who averaged 20.3 yards per reception last season and had eight receptions of 25 yards or more. The offensive line seems poised to make a significant step forward in 2018. Mendenhall acknowledged that the loss of Fannin, who is sidelined for an undetermined amount of time with an injury, is a “concern,” but his statement is encouraging. Additionally, quality experience returns. All five starters at Monday’s (August 6) practice – per Jeff White of VirginiaSports.com, the group included Chris Glaser (left tackle), R.J. Proctor (left guard), Dillon Reinkensmeyer (center), Jake Fieler (right guard), and Marcus Applefield (right tackle) – have starting experience. Fieler is looking to build off his best season as a Cavalier, while Glaser and Reinkensmeyer each played well as freshmen last season (Reinkensmeyer started 11 games as a redshirt, Glaser emerged in the latter part of the year as a true freshman). Proctor was a regular in the rotation last season, earning five starts in 13 games, and Applefield started 10 games at Rutgers last season. Fannin’s loss hurts the depth, but sophomore guard Ben Knutson and redshirt freshman tackle Ryan Nelson should be valuable members of the rotation. If Fannin returns and the rest of the line stays healthy, Virginia could boast a very good 8-man rotation. And who knows, maybe redshirt freshmen Gerrik Vollmer and Ryan Swoboda and/or one of UVA’s five true freshmen scholarship linemen can earn significant playing time as well. An injury or two could really test the depth further. Otherwise, I like the experience and the talent returning. Now is the time for this group to take a big step forward. Virginia features a solid, tough group of running backs led by one of the hardest workers on the team in senior Jordan Ellis. The ceiling of this group remains to be seen, but a better offensive line and a talented dual-threat quarterback in Bryce Perkins should give us a good idea. Junior Chris Sharp and sophomores Lamont Atkins and PK Kier figure to serve as the primary ballcarriers behind Ellis. Sophomore Jamari Peacock is a big back who played extensively last season as a true freshman; however, he has been used primarily as a blocker. True freshman Wayne Taulapapa enters the picture as well after coming off a two-year mission trip. Atkins and Kier are wild cards for this team. Both had stellar high school careers, and both showed some positive things during the spring. They could play significant roles this coming season. Both players have better breakaway speed than Ellis. The overall speed of the group is not blazing, but Virginia will utilize Perkins and Zaccheaus to bring an added spark in that department. Right now, quarterback is high on potential but little on proven experience for UVA. The staff is obviously very high on Perkins whose highly intriguing tools are highlighted by his speed and running ability. The only post-high school experience he has, though, came last year on the junior college level. While he played well, he has yet to prove he can play at a high level on the major college level. The talent is there, but it’s a wait-and-see deal right now. Sophomore Lindell Stone is currently Perkins’ backup. Stone played in only one game last season as a true freshman. True freshman Brennan Armstrong, another dual-threat quarterback, is the final scholarship quarterback on Virginia’s depth chart. A good looking prospect, but again no major college experience at this point.